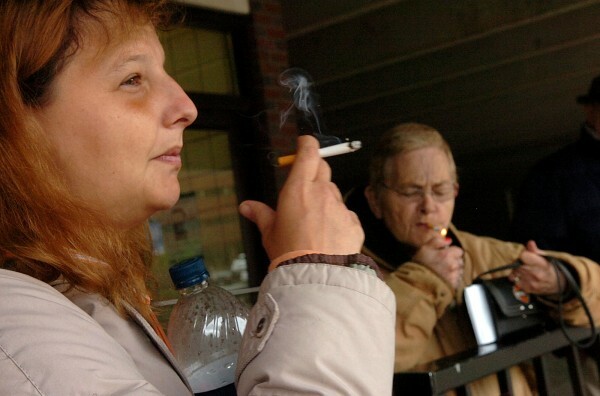 Crystal Fogleman (left) and Alice Goan (right), both of Bangor, smoke cigarettes as they wait for a bus in downtown Bangor in 2011. Boosting taxes on cigarettes is an effective way to cut smoking rates among adults and, even more, among those college-age and younger, along with tobacco-related disease and death. A case in point is Maryland, where the incidence of smoking fell by a third from 1998 to 2010, a period during which the state more than quintupled its cigarette tax. By the same token, states that have allowed cigarette levies to remain low generally suffer from higher smoking rates and the resulting effect on public health. Virginia’s cigarette tax is second-lowest in the nation, after Missouri’s; it is an example of a state that extends its smokers a license to kill — themselves. Pleased with the results in Maryland, anti-tobacco advocates want to build on their success. On the merits, they have an easy case to make. Higher taxes are particularly effective in cutting tobacco use among younger smokers, whose habits are less entrenched and who are more sensitive to price. As a direct result of the 2008 tax increase, youth smoking rates plummeted by almost a third in two years. In 2009, just 12 percent of Maryland youths were smokers, compared with a national rate of almost 20 percent. Complacency is the wrong course of action. Following the big drop after 2008, smoking rates in Maryland have started to inch up again. That coincides with an 80 percent cut in spending on the state’s main anti-smoking program. Each of the three increases in Maryland’s cigarette tax over the past dozen years has been followed immediately by a sharp drop in sales. The tobacco lobby remains strong enough to push back against further increases. In Annapolis, a bill this year to raise the state’s per-pack tax to $3 died in committee. Anti-smoking advocates are focusing their efforts on the next year or two in the legislative calendar. They should be helped both by the counter-example of Virginia — and by the facts.